Absolutely there is no doubt, this is the best hostel i stayed. I loved it so much that i came back. I love the vibe here, it is so positive. You will notice this right when you enter. The colors, the people.. everything. The rooftop is so chilled out and the staff is super friendly. Oh boy I liked staying here, the staff were super friendly, and the hostel was in a cool and chilled out part of the city. It felt like a really nice European hostel. The free breakfast poha was delightful as well. Wish I could have stayed longer!!! This was the perfect hostel for me. The guys running it go out of the way to help you. It is a bit away from South Mumbai, but there were tonnes of things to do around here. Especially the Hare Krishna Temple which is amazing. The monk showed me around and told me the story behind it. Also had the lunch there which was delicious. A must visit if you are in Mumbai. I just went one day for the sightseeing and later i explored this side of town which actually gave me a better local experience. This place was A-mazing! After spending a few days in touristy Colaba, I wanted to experience a different side to the big city and hostel mantra gave me that. Wish I could have spent my whole trip in Mumbai here! Dorms were big, kept clean and had air con. Bhushan (the owner) gave us from really good recommendations for things to do and even took us out for some excellent Pani Puri! The staff were super friendly and even offered to make us tea whilst we were relaxing in the lounge area! I felt so at home here, i received the warmest greeting and met so many people, Thank you to Mayur and Panky . The staff were helpful and gave us information to make plans for Mumbai. 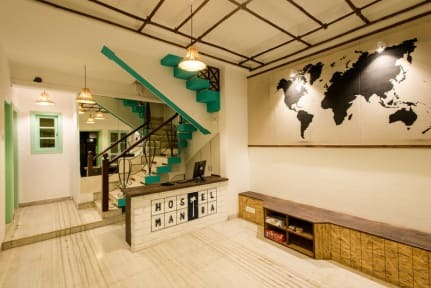 But this hostel is also far away from the south where most major attractions are. So it does give you a good opportunity to use the trains and public transport if you want to experience a more suburban and locals perspective. But if you want to be close to everything it's not ideal. Not ideal for solo travellers as it wasn't very busy. But the staff really are lovely and i would go back and reccomend it for that reason.